We reached the Garden of Gethsemane after hiking down a winding, slippery road on the Mount of Olives, east of the Temple walls in Jerusalem. The pavement was so treacherous and the road so steep that we had to hold on to handrails as we weaved our way down. 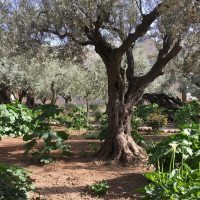 But we eventually made it to the traditional site of the Garden of Gethsemane—a modest, walled-off garden with many old, stout olive trees. No one knows if this is the actual site of the garden, but it’s in the right general location, and it certainly fits the image. The age of the trees is unknown because olive trees do not have rings that mark off years like most trees. But carbon dating has estimated that some of them go back to the 1100s AD. The word “Gethsemane” means “oil press” in Hebrew, a fitting name for the spot where the sins of the world pressed down on Jesus on the night He was arrested. It is believed there was an olive press near the garden and hence the name. The olives were placed in a stone pit, explained our guide at Nazareth village as he motioned toward the pit holding the big millstone. Then a donkey was hooked to the millstone, and it pulled the massive stone wheel around in a circle, crushing the olives beneath. 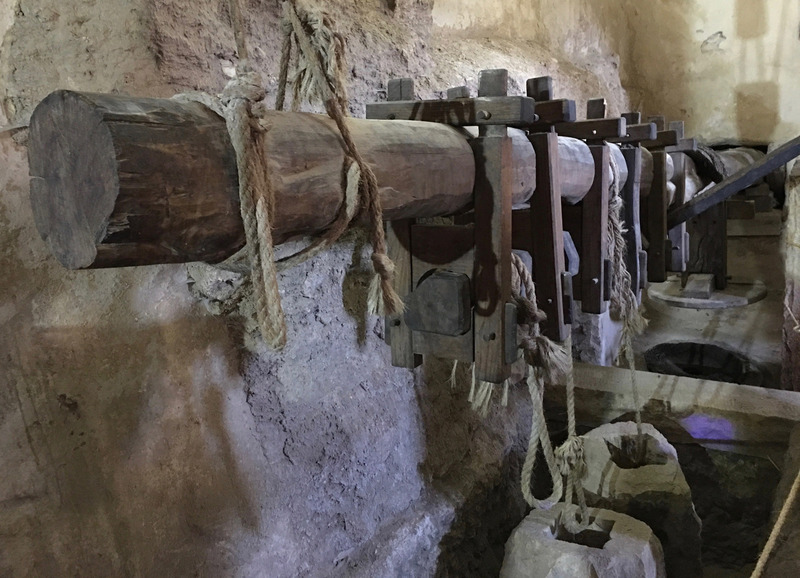 According to our guide, the millstone was designed to crush every bit of the olives, including the seeds, turning them into a mash that filled about 15 baskets. This was the “crushing stage,” and it was followed by the “pressing” stage. The baskets, which have holes in them, were hung onto the long beam of the olive press. The olives underwent three presses, he said. During the first press, no pressure was put on the basket and the olive oil simply dripped into a 3-foot deep vat. Olives are one-third oil, one-third water, and one-third mash, and the oil rises to the top. So, they just scooped off the oil, and they had what was called their “first fruits.” The first fruits, the finest oil, belonged to the Lord, and it was used by the priests in the Temple. During the second press, they used a stone weighing about 500 pounds to put pressure on the baskets full of olives. 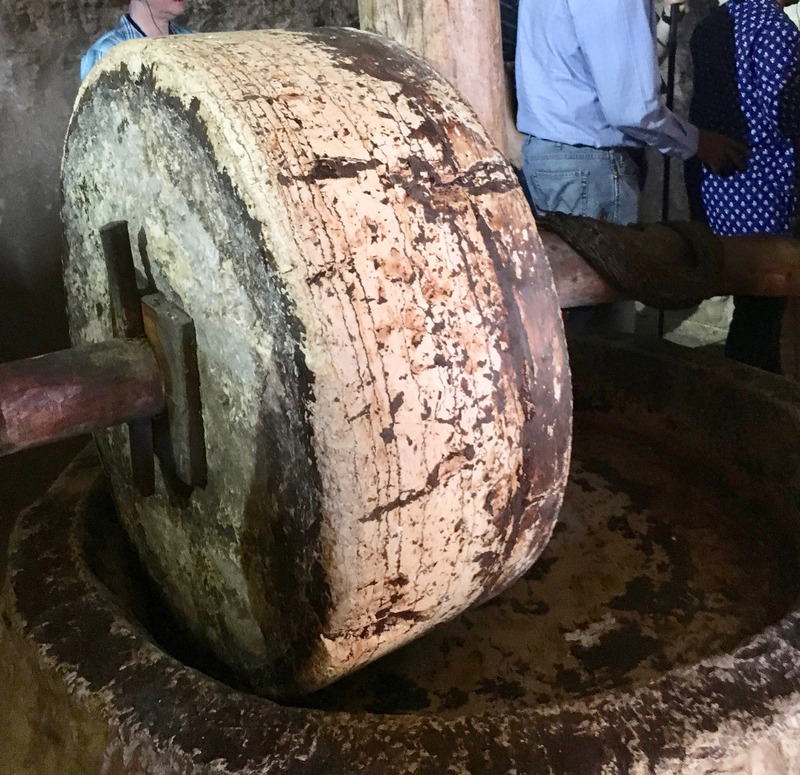 The quality of oil from the second press was still good, our guide said, so people used it for food, medicine, and cosmetics. But there would still be oil inside the olive mash, he said, so people used stone weights to add even more pressure and squeeze out more olive oil. Because the quality of oil from this third press was not as good as the other two, the oil was used for lamps and to make soap. Here is why I bring up the process. When Jesus was in the Garden of Gethsemane, He prayed three times. Three presses. Three prayers. Luke 22:44 says, “And being in anguish, he prayed more earnestly, and his sweat was like drops of blood falling to the ground.” The sins of the world pressed down on Jesus with such weight of sorrow that blood squeezed out of Him like oil from crushed olives. While Jesus prayed in anguish, His disciples were taking the easier way—sleeping. Jesus could’ve taken the easy way as well. In the Lexham Geographic Commentary, Aubrey L. Taylor points out that the Garden of Gethsemane was located close to a road often used to escape from Jerusalem. So, Jesus could’ve easily slipped away down this road and disappeared into the wilderness. That would’ve been the easy path. But Jesus took the hard way—the way of the Cross. The way of the oil press. We all experience “presses” in our lives—pressures that seem more than we can handle. So, ask yourself: How do I respond when my life gets difficult? Do I snooze? Do I run? Or do I face my troubles with prayer, as Jesus did, even under the pressure of a hundred rocks? How did Jesus pray at the Mount of Olives? Who appeared to Jesus in the garden? This passage does not mention the Garden of Gethsemane by name. What passage does mention the garden? What did one of Jesus’s followers do to the servant of the high priest? What were times in your life when you felt great pressure weighing down on you? By: Doug Peterson has written 42 books for VeggieTales and is the author of four historical novels: The Disappearing Man, The Puzzle People, The Vanishing Woman, and The Lincoln League. His latest book is The Call of the Mild. Visit Doug at www.bydougpeterson.com.